The act of naming is an on going process where we are all poets in a communal enterprise that stretches back thousands of years. The act of naming is the secular baptisms of the everyday. The declaration of a new name is a form of poetry – the reduction of poetry to a proper noun – the Dadaists and the Lettristes wanted to take the reduction of poetry further to single letters and phonemes. It is a type of poetry consisting of only a few letters, a couple of words yet so much can be generated with a proper noun – sounds, mystical observations, wit, evocation, even satire. A name can refer to other names to evoke historic or metaphoric meaning or simply be a pleasing play of sounds. There is the religious mystery of names, or the philosophical problem of how a referent connects to the referred; a proper noun a name generates an image in the mind. The act of self-naming by a person, a group, a band, a crew –creating on a new name as a new identity the nom de plume, nom de guerre, a tag (nom de rue) is different from the poetry of the common names given to plants and animals or to the nicknames given to people. It is an autonomous self-conscious action consequently often far more artistic because it is not bound by official titles or the dictates of the masses. Self-naming entered art at that the moment of modern magic when the word “Dada” was selected at random from an encyclopaedia. And the Dadaists were equally busy reinventing themselves making an art of creating new identities: Jan Hertzfeld became John Hartfield, Marcel Duchamp became Richard Mutt and then Rrose Selavy and Arthur Craven was an invented identity by Fabian Lloyd. There was another point in the 1960s when there was a change of band names from straight names to poetic names. And then a point in the late 1970s when musicians adopted names that no-one could mistake for their real names: Johnny Rotten and the rest. The story of how the name developed is a standard question for reporters. Endless articles have been written about band names – Blah Blog, a Melbourne blogger comments on the poetry of band names in Arthouse line-ups. It appears to be such a trivial issue but it raises a profound philosophical question of names and identity – the new name subverts the authority of the state or the mass to name things. 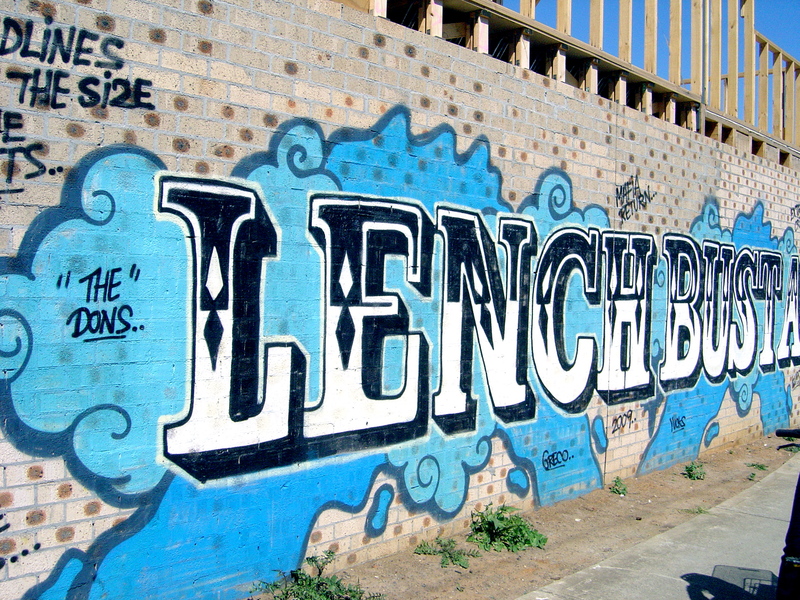 From the names of the gangs of New York City, to avant-garde art groups, bands, punks, street artists and taggers the poetry self-naming exists in defiance of the paternal right to name. Auto-baptism is the poetry of ontological anarchy. This entry was posted on Wednesday, August 8th, 2012 at 5:50 PM	and tagged with Dada, Names, poetry, proper nouns, punk and posted in Art History, Culture Notes. You can follow any responses to this entry through the RSS 2.0 feed.